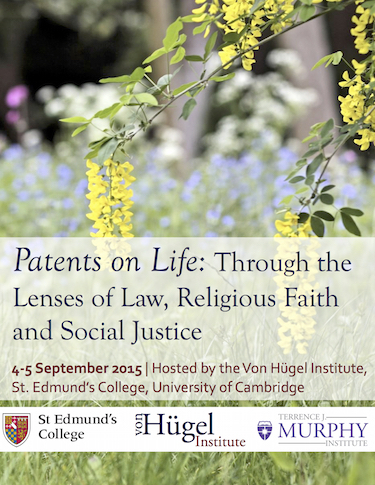 I was flattered and delighted to be invited to lecture at a conference titled ‘Patents on Life: Through the Lenses of Law, Religious Faith and Social Justice’ on 4-5 September 2015. The conference was co-sponsored by the Von Hügel Institute (VHI), an interdisciplinary research institution dedicated to the study of the relationship between Christianity and society based at St. Edmund’s College, University of Cambridge, and the Terrence J. Murphy Institute, University of St. Thomas, Minnesota (USA), which is a US institute with a similar agenda. The program was organized by Dr Roman Cholij, a Cambridge based trademark attorney who spoke at an event I organized on ‘Intellectual Property in Jewish Law‘ back in 2011 together with the Yad l’Rav Herzog Talmudic Research Institute which publishes the Talmudic Encyclopedia. I invited Dr Cholij to talk about IP in the Christian tradition and also invited Professor Amir Khoury of Tel Aviv University to talk about IP in Arab Countries, to provide some colour and contrast in that conference which was top heavy with Rabbis and Orthodox Jewish IP Professors such as Jeremy Phillips (trademarks) and David Nimmer (copyright). It seems that that conference was the inspiration for the present one, so I seem to have god-fathered a Catholic conference! As Koheleth (Ecclesiastes 11:1) put it: “Cast your bread upon the waters, for you will find it after many days”. Taken from their website, the Von Hügel Institute (VHI) is an interdisciplinary research institution dedicated to the study of the relationship between Christianity and society based at St. Edmund’s College, University of Cambridge. Founded in 1987 the institute preserves and develops the Roman Catholic heritage of St Edmund’s and carries out research on contemporary political, social, legal and economic issues from the perspective of Catholic social teaching. The VHI is committed to an ecumenical approach working with Christians and other faith groups and responding to challenges to the common good and threats to human dignity and life. The participants of the conference were housed in the cloisters dormitories of Murray Edwards College, which I remember as New Hall. I had several friends, mostly seminary semi girls that were registered and studied there. However, I’d never seen the dorms. They weren’t that kind of girl women. Each room had a bed, a wardrobe and a desk and bookcase, with on suite bathroom. In Yeshiva, we were three to a room of a similar size (1 bunk + 1 single). However, study took place in pairs in the Bet Midrash or study hall, resulting to an ambient noise level that may occur in the canteen in Cambridge, but I doubt would be tolerated in the library. In addition to Israel’s top IP blogger, the star cast of speakers included top Vatican officials, academics, lawyers, industry professionals, theologians and representatives of the US Conference of Catholic Bishops and attracted lawyers and patent attorneys, theologians, bioethicists, social and political scientists, environmentalists, life scientists and students of law, religion and social justice. It would be very time consuming to reproduce all the excellent presentations, and I understand that a book of the papers presented is forthcoming. The following blog postings detail each session and some of what were for me, the highlights of the event, and some thoughts about the similarities and differences of Judaism and Catholicism.